You are here: Home / Blog / Articles / How do mushrooms grow? We are dedicated to providing the kits, products and knowledge you need to successfully grown your own tasty, healthy and organic mushrooms at home. If you wish to know how to grow mushrooms, we provide all the help and products you need to get started. You may be wondering – how does the growth process actually work? Growing mushrooms is a fairly simple and always enjoyable process, especially when you are using our equipment. Unlike other plants, mushrooms don’t grow from seeds, but from spores which are too small to be seen by the naked human eye. As mushrooms are a form of fungi, the spores do not contain chlorophyll like other plants, which means they rely on nutrients for their growth. The first stages of growth involve the appearance of tiny white roots called mycelium, which emerge from the spawn before anything resembling an actual mushroom begins to appear. We can provide you with these in the form of plug spawn, grooved dowels which have been colonised with mushroom mycelium, combined with the nutrients they need to grow. You will also need to consider the growth medium you are going to use. 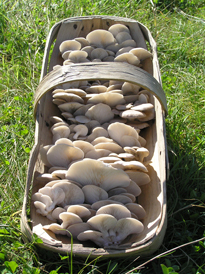 Our mushroom kits are very versatile and can be grown in a wide range of settings. We have kits for use in different growing mediums, including logs and old books. If you are growing without a kit, you will need to identify the needs of your particular mushroom type in order to achieve successful growth. The exact conditions needed for optimum success will depend on the type of mushroom you are trying to grow. In general, mushrooms flourish best in dark, moist environments, so as long as you have a place in your home or garden that meets these conditions, you are ready to grow. If you wish to learn more about how to grow mushrooms, why not make a booking for our one-day introductory workshop? Here you can learn all about the way mushrooms grow and discover how you can successfully cultivate your own mushroom crops at home.